DISCONTINUED. Size isn't everything. It may be small (we're talking 60x38x28) but the Glow-Worm Flexicom 24kW heat only boiler is a good example of the best things coming in small packages. Providing hot water from a separate storage cylinder this high efficiency condensing boiler has a SEDBUK efficiency of 88.4%. Available in six different outputs which range from 12kW to 35kW to cope with a wide range of heating and hot water requirements in domestic properties according to Glow-Worm it's the only boiler on the market that can be used with a direct rear flue enabling installation practically anywhere. This wall-mounted boiler is small enough to fit inside most kitchen cupboards. It features a digital display and basic and simple to use controls - namely buttons to control the central heating temperature and a mode switch. 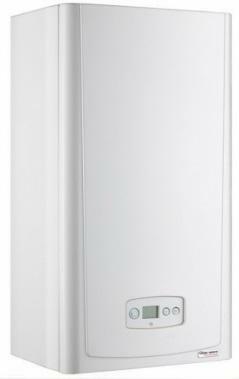 The Energy Savings Trust recommend this boiler.